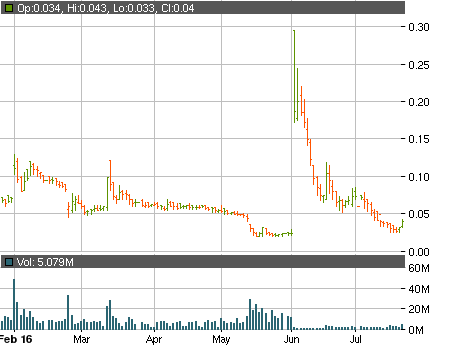 Ascent Solar Technologies, Inc. (OTCMKTS:ASTI) has had a pretty nasty time in the charts this year. The ticker was hovering well above the $1 per share mark during most of the first half of 2016, but managed to lose more than 95% of its value over the course of the past couple of months. Then ASTI decided to exercise a 1-for-20 reverse split and it did so about a month and a half ago. Things didn’t go any better after it and the ticker continued to slide down the charts even more vigorously. Meanwhile, the latest financial report does show that ASTI isn’t doing all that well. To be fair, ASTI does manage to generate some decent revenues. The liabilities and the losses, however, are simply massive. Still, the market cap of the company has dropped significantly and now sits below $1 million, which is low even by OTC standards. It seems that investors have the same opinion as we see ASTI gaining altitude fast in the past couple of sessions. Last week ended with a 23.08% gain and the ticker finished with a price of $0.04, while a total of 5.62 million traded shares generated $213 thousand in daily dollar volume. The company stock is still going strong today, but that doesn’t mean that you should skip doing your due diligence and weighing out the risks before putting any money on the line.